What is pet therapy, and how can it help people living in residential care? Pets make people happy, which is why so many of us choose to keep a pet at home. But as well as making us smile, the health benefits of engaging with a pet are numerous. Playing with a friendly animal, be it a dog, cat, rabbit, guinea rabbit, or other friendly four legged friend has been proved to reduce stress, lower blood pressure and improve mood. Older people living in residential care may no longer be able to look after a pet of their own, but for any animal lovers among them, a visit from a cute and cuddly pet can work wonders in helping to lift their mood, reduce anxiety and encourage engagement with the people around them. 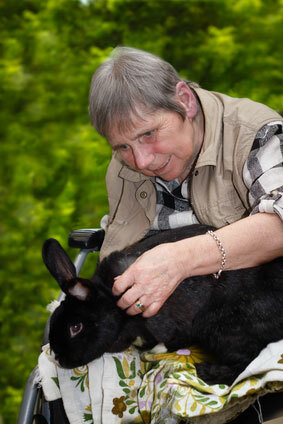 Pet therapy is a guided interaction between a person and a trained animal with its handler. The intention is to bring enjoyment and thus improve the person’s health and wellbeing. It is being introduced into nursing and residential homes at a fast rowing rate as the benefits become ever more widely recognised. ​Is it suitable for everyone? Pet therapy works for people who are animal lovers, and those who have enjoyed keeping pets in the past. Anyone with an allergy to pet hair, or who doesn’t like animals would find the experience highly uncomfortable so should be kept well away. And people in the later stages of dementia may find the experience confusing so would probably benefit more from a robotic pet rather than the real thing. Sanitation and supervision need to be obvious concerns to ensure hygiene is maintained and everyone remains safe, but with careful planning, a visit from well behaved, friendly pets can really brighten the day for many residents. Whether it’s allowing relatives to bring with their own pets with them, or a series of visits from a professional pet therapist, the benefits can be tangible and long term. A positive pet visit can provide not only immediate amusement but can also leave people in good spirits for quite some time afterwards.